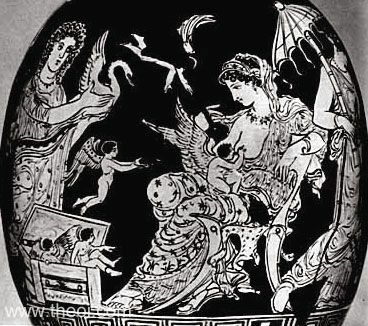 The goddess Aphrodite is surrounded by a flock of Erotes (winged love-gods). One suckles on her breast, two flit through the air, and another pair play inside a chest. She is accompanied by two attendants, probably Charites, one holding a sun-umbrella and the other a swan.